Container Market Report February 2019 | EF International Ltd. It is one week from February 4 to 10th in the Chinese lunar New Year of this year. For this spring luck (from January 21 to March 1), it is the migration of a total of 3 billion people in China. Among them 7 million people go out abroad. It is said that Japan is No.1 they want to go. Is that a reason? 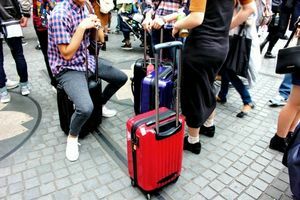 I see the scene of the Chinese like youth, a couple and family pulling a big luggage wherever I go these days. I utterly appreciate it very much that they come to Japan. The Chinese visitor to Japan of 2018 is 8,380,000 people. All foreign visitors to Japan in 2018 is 31,191,900 people so that Chinese people is 27%. It increased 13.9% compared with the previous year. On the other hand, the total amount of money they spent in Japan is 1,000,025,700,000 yen. I heard that there are many Chinese visitors who go to the local city where we have never gone. I eagerly expect them to make a lot of good memories and to return. This apply to the foreign student in Japan. They could change to strong supporters to Japan if we could make them understood Japan truly when they come to Japan. It may be necessary to snuggle up to their feeling more without saying that a manner is bad, and giving a dirty look. This is the diplomacy means that we could be much more reliable and effective than diplomatic relations of the state politics. For the interest of the local village and town I sincerely wish them to grasp the true needs of the foreign visitors and establish the Win-Win relationship with them to activate a village, a town and a district. I think that it is so in all, but there is time to say that it is necessary to do it now. I think now at the important time. When world eyes face Japan, we pay more attention to the world, too and want to make the needs form. With the understanding of each other between an own country and the other country. I am convinced that there is a hint of mutual prosperity in that. A period of grace raising the rate of interest of the sanctions duty for the Chinese product of 200 billion dollars (approximately 22 trillion yen) of the United States to 25% from 10% approaches on March 1. When it is carried out it is said that GDP would be reduced 1% to China and 0.4% to USA respectively. The growth rate of the period from October to December in 2018 in China reduces 0.1 points the period from July to September. It is with three quarters consecutive slowdown. As a result, the growth rate dropped in 6.4%. With China’s economy slowdown, China invokes domestic economic measure solemnly. It is economic measure more than 2,500 billion yuan (approximately 40 trillion yen). It is 1,500 billion yuan for a reduction of taxes. Railroad investment is the major but it is 1,160 billion yuan for infrastructure investment. There is the fact that China spent “4 trillion yuan” (approximately 56 trillion yen) after Lehman shock of 2008 and pushes up economy, and saved the world economy. Can they take an effect measure this time? If the U.K. will secede from EU without the agreement in March, further confusion waits for the world economy. On the other hand, the shipping lines have been facing the issue of long stay of the container in U.S.A. ports under a U.S. and China trade war now. It had firstly been caused by the import rush to the U.S. by the end of December 2018 and 2nd import rush to the U.S. created after it has been postponed until March 1. Mass export dashes before the Luna New Year in the Chinese side. The confusion in the ports of the U.S has been created by the long stay of the container. Lack of chassis and shortage of drivers in the port district of the U.S. have accelerated more congestion. A delay of the taking care of the container, long stay of container have been causing the port space problem, confusion of stevedoring work and it has caused a vicious circle. 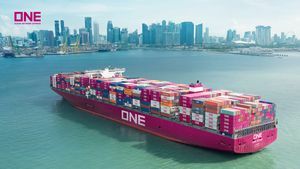 According to the Daily Cargo the eastbound cargo from 10 Asian main countries to U.S in 2018 reaches a record high in 7.8% increase to 16,887,028TEU compared with the previous year. A export from China to U.S. is 8.1% increase to 10,490,000 TEU compared with the previous year. It occupies 60% of outbound cargo from Asia to U.S. Inbound has been limited due to import restriction by Chinese government on abolished plastic, the wastepaper etc. so that the inbound volume of Nov. 2018 from U.S. to China is 17 against 100 outbound from China to U.S. The difference is quite big as we understand that inbound is understood with an average of 40. Many containers should be moved in empty from U.S. to Asia so that it will cost shipping lines more. The volume of on-lease containers will increase in the fleet of shipping line. I consider it to tend to increase still more. Shipping line will not lease the long-term lease of the new container on the spot basis because they have planned the procurement of the new container premeditatedly. On the other hand, they will give priority to procurement in MLA. The leasing company tends to require various incentives because it is a seller’s market. At first the orthodox condition is containers for return to China leased out of China which is so-called Round Trip Lease. The next requires Round Trip Lease plus Pick-up-Charge. Furthermore, they may ask for Minimum Day. All conditions seem to be required now. In this sense the major leasing firms’ utilization of 98~99% seems to become more realistic. It seems to be difficult unless they would accept it as most of the major leasing companies follows as others do. It is particularly the case under the present conditions of oligopoly accounting for more than 80% of leasing containers occupied by the major 6 leasing companies in the world. But a smaller lease company does its best these days. So there is the way to lease from the small leasing company to break the present conditions. Their leasing terms should be more economical than one from a major leasing company. Even in the present seller’s market a shipping line could considerably cheaply lease containers from them. On the other hand, a shipping line could contain a major leasing company by using a small one. I think that there is room to reconsider it enough as a shipping company. The new container price of the end of January 2019 is $1,750 per 20f. The new container stock in all China factory is 806,840 TEU (Dry: 771,980 TEU, Reefer; 34,860). The new container price does not change with the last month. As for the factory stock, the number of Dry and Reefer increased a few respectively from the previous month. Among 44 production lines of all Chinese container makers, production Stop is indefinitely applied to 5 Lines. It is 8 lines to be absent from production during the lunar New Year from this January. Most of them stop till the end of February. There is the factory to stop till the middle of March, too. The amount of container production in 2018 increased to 4.2 Million TEU and double from 2 Million TEU of 2016. It is remarkable recovery. But it seems to become considerably difficult age this year for a Chinese maker as far as the present world economy trend is concerned. Copyright © 2019 EF International Ltd.